Enlarge/ I'm king of the mountain! Fortnite: Battle Royale hasn’t quite grabbed me. While the game is at least accurately named, the gunplay—originally designed to let players mow down hordes of mostly mindless AI bots—isn’t as suited for culling other human players in a Battle Royale mode. Developer Epic Games seems to know this and is tirelessly tuning the overnight smash hit’s bullet burping. And while 3.4 million concurrent players (as of February) don’t seem dissuaded by this continued fine-tuning, I still feel like the gameplay isn’t quite up to snuff. Yet I still can’t stop thinking about the game. That’s partly because it’s seemingly the biggest game on the planet—hot on the heels of the extremely similar, previously biggest game on the planet, PlayerUnknown’s Battlegrounds. But it’s not just that. Fortnite appeals to me, personally, because it does more than remind me of my past. It gives me glimpses into an alternate present. I didn’t particularly mind this narrow career ideal at the time. I liked building things. Between soccer and speech classes, I filled sketchbooks with impractical structures and robots. Two of my uncles, both engineers themselves, humored me by helping with mock-up Battle Bot “schematics” that never left the page. A bit of that old obsession has resurfaced in Fortnite: Battle Royale. The shooting may not meet my gameplay standards, but racing to build the most efficient fortresses sure does. And that’s just how most of Fortnite’s pitched battles end—in spastic competitions to raise zig-zagging siege towers, each player looking to gain high ground over (and cover from) the other. Fortnite really takes me back to those days of Battle Bots and uncles, and the scads of tree forts that arose from that same obsession with making something out of nothing. My brother, friends, and cousins built those forts in the woods near a park and in the shelterbelts overlooking the creek behind my grandmother’s place. We even set up a sort of wall-less headquarters (reinforced with snow during the winter) between three pine trees which, I would later find out, belonged to our mayor. Nobody ever kicked us out, though. Well, nobody else ever kicked us out. We attacked each other all the time—either for the snowball fight fun of it, or because of “very serious” fallings-out. For me, that fort-building was a chance to show off something I felt trained to be good at in the childhood turf wars that would have happened anyway. These days, I’m not good enough at Fortnite to see the closing moments of most matches firsthand. That, plus my natural disinclination to the gunplay, has pushed me towards watching matches on Mixer’s never-ending, mildly brilliant “HypeZone” channel. The streaming service cycles between players who have reached the top 10 of their respective matches. 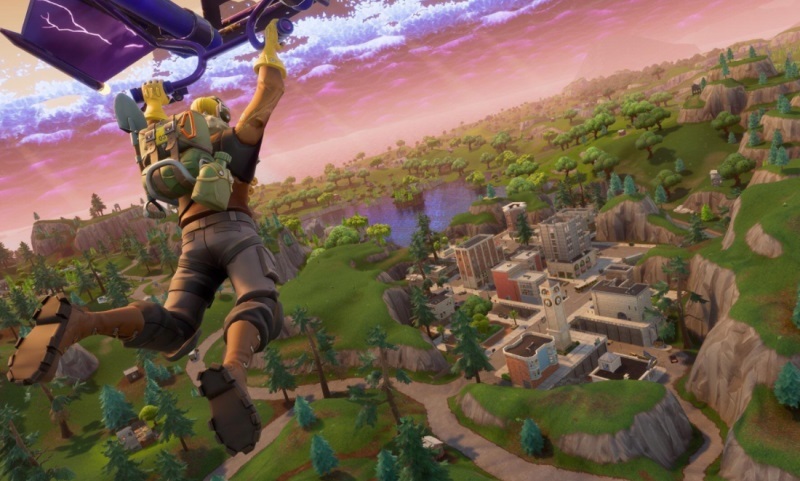 It’s Fortnite at its most geographically and dramatically condensed. And it’s exactly the kind of junk-food viewing I need to fill the Junkyard Wars-shaped hole in my life. In this phase of the game, rocket launcher duels dissolve into cooperative races against the clock as panicky combatants rush to escape the all-destroying storm that pushes them closer together over the course of a match. The few competitors at this stage will build improbable bridges under their very feet and sprout brick citadels with arrow slits for snipers to see through. Often, winners are victorious not with bullets but with pickaxes—toppling towers to introduce their foes above to aggressive fall damage below. Building in games might always appeal to me in a creative context, but these competitive building scenarios also tickle the math-loving sectors my parents drilled into my brain—the ones that have made me obsess over efficient character builds in EVE Online, Darkest Dungeon, and Dota 2 ever since. 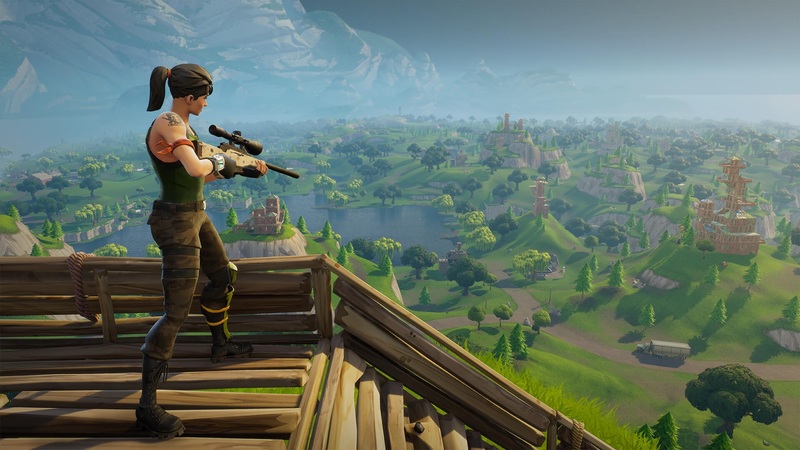 The winner in Fortnite: Battle Royale isn’t just determined by who shoots better or faster; it’s about who can master the space they’re in.